Why is it important to study the ancient Israelites, a people whose history was recorded in books more than 2,000 years ago? The answer is as simple as it is powerful: They created monotheism, the worship of one god. Israelite writings recorded the many interactions they had with their god over the first millennium B.C. Collected into the Jewish Hebrew Bible and, then, the Christian Old Testament, they became the foundation for three of the world’s major religions: Judaism, Christianity and Islam. Nearly half of the world’s population, at least its religious population, look to ancient Israel for their religious roots. So, how do we study the ancient Israelites? For centuries, even millennia, people looked to the Old Testament when they wanted to know about the Israelites. The advice was, if you want to know about ancient Israel, read your Bible. The problem with this advice is that the Old Testament is incomplete. It does not give a full picture of Israel’s history, its religion or its way of life. Gaps appear everywhere. Take the language, for example. Modern Americans know more than 20,000 words; the Old Testament has only 8,000 words. It speaks of combing hair, but lacks the word for comb. It talks about sewing, but gives no word for needle. Enter archaeology. About 150 years ago, archaeologists began excavating in the Middle East, from Iraq and Syria to Israel and Egypt. Their discoveries clarified questions from the Bible and filled in the gaps of the Old Testament. A new field was born called biblical archaeology, a field of biblical studies that brought archaeological finds to supplement the Bible. In some cases, pastors became archaeologists and excavated, as one wag put it, with a trowel in one hand and a Bible in the other. Biblical archaeology became the basis for a new type of book about Scripture, especially at the beginning level. Books for college courses and general readers featured the Old Testament text but brought in archaeological finds where they supported or illuminated biblical stories, history or religious practice. Such introductory books are still used in Old Testament survey courses in colleges and universities today. The biblical text provides the basis for each work’s organization, both overall and for each chapter. Archaeological results and discoveries are brought in as relevant and discussed for the light they shed on questions generated by Scripture. In the 1970s, however, Middle East archaeology broke away from its attachment to biblical archaeology and joined the wave of “New Archaeology,” as it was called then. Uniting with other forms of archaeology, it returned to the field’s roots in anthropology. As a result, it became much more scientific and developed new areas of expertise. Archaeozoology and paleoethnobotany, for example, identified practices of food processing, cooking and eating -- a large hole in our earlier understanding. Despite the huge expansion of archaeological knowledge during the last 50 years, introductory books and textbooks about ancient Israel continue to follow the model established by biblical archaeology -- focusing on Scripture with archaeology only supplementing the discussion. But, the old saw mentioned above no longer holds. Today, the truth is, if you want to understand the Old Testament, you must study the ancient Israelites. Archaeology and historical analysis today provide a fuller picture of ancient Israel than does the Old Testament. Does that mean we should ignore the Old Testament? By no means. Both archaeology and Scripture constitute primary sources for the study of ancient Israel. They must be used together for the most complete historical picture. This fall sees the publication of the first introductory book that does just that -- a book suitable for both general readers and introductory college courses. It is called “The Old Testament in Archaeology and History” and is edited by a team led by Jennie Ebeling and Edward Wright, and includes Mark Elliott and myself. The chapters are written by experts in archaeological research and biblical studies, and bring together the latest finds and best analyses to provide a history of ancient Israel. The book takes a historical approach to understanding the ancient Israelites, bringing together biblical evidence and archaeological discoveries to address questions of historical analysis and understanding. Rather than pit the two kinds of data against each other, it treats all the information equally; indeed, it often finds them on the same side. I will end with a shameless plug: Read this book! You will gain the fullest and most complete understanding of ancient Israel available. In 1517, five hundred years ago this month, Martin Luther nailed 95 Theses to the door of the Wittenberg Cathedral. Six years later, the Catholic Church excommunicated Luther and by 1526 he began organizing a new church. This was the beginning of the Protestant Reformation. Note: On October 15 and 16, the Religious Studies Department at the University of Wyoming will host a mini-conference Protestant Reformations: 500 Years and Counting. There will be a public lecture on Monday the 16th at 4:10, by Philip Cary, “How Luther Became Protestant” in Berry Center 138. For more information, visit uwyo.edu/relstds. A sliver of white is lifted above a platform below a small dome surmounted by a tiny cupola. The dome is supported by four columns. At least that is what I think I see from across the museum gallery. A closer look brings a sudden shock: the white sliver is bone, a human finger. The finger’s platform is constructed out of bullets and shells, the dome and cupola covered with shotgun pellets and the columns are pistol barrels, with the pistols still attached. According to the label, the finger belongs to “Santo Guerro”, a purposeful misnaming of an imaginary “Saint of War.” (Or does it mean Saint Blondie?) But the odd name is less important than my reaction upon viewing the image. 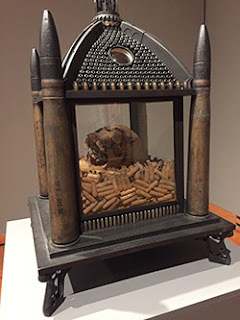 Not answering my questions, I move on…and immediately run into the reliquary of Santo Guerro’s skull, lying in a glass box on top of a pile of empty 30-06 rifle shells. The skull’s unhinged grin mocks the serious character of its bed. Before the two reliquaries stands a model of a large Gothic cathedral. It is made mostly from ammunition, intricately put together. The child in me who loved models is attracted like a magnet; without thinking I spend 5 fascinated minutes examining the doors and walls of shells, the soaring towers framed by rifle barrels, and the flying buttresses made from gun stocks. I check the museum guide, expecting a name like Trinity Cathedral or some other name of a cathedral city. Instead it says, “The Spine and the Tooth of Santo Guerro.” Spine? What spine? I haven’t seen a spine, let alone a tooth. Wait, there it is. In the shadows within the cathedral. The model too is a reliquary. I start looking at the other models of sacred structures: synagogues, churches, mosques and mausoleums. I find a Bible open to the book of Revelation in a church, a Torah scroll cover in a synagogue model. The Muslim mausoleums contain tombs. They are all reliquaries. It is often difficult to interpret art, to find its meaning. But one point is clear, the images are of the sacred and holy (saints’ remains, sacred texts and accoutrements) contained within the symbols of violence, ammunition and weapons of death. Even the models of Muslim mausoleums fit the pattern, for mausoleums usually contain the remains of holy men (sort of like Christian saints). Some forms of Islam, like the Saudi’s Wahhabism, vehemently deny that Muslims can be saints, be holy men, and that they can be revered after death. Indeed, they frequently enforce that denial at the point of a gun. Al Farrow’s artworks clearly juxtapose violence and the sacred. But what is the message? He won’t say, so its remains unclear. What is clear, however, is that the exhibit grabs your attention. It may not provide answers, but the viewers certainly raise the question and discuss it among themselves. I often found myself across a piece from a stranger, pointing out features and debating with each other. The exhibit also contains three full-size doors (constructed of ammunition and gun parts) of religious structures: a mosque, a church and a synagogue. Each one is presented with graffiti and other violence enacted upon it. Perhaps the message is that religions visit violence upon each other. Hmmm. Al Farrow’s exhibit, Divine Ammunition, will be at the UW Art Museum in Laramie, WY until December 16, 2017.